With this package, you get an autographed, personalized, paperback book and you get a Limited Edition minted collectible “Challenge Coin” designed for this book release only. There are only 500 minted, each individual coin is laser etched with its own unique number. 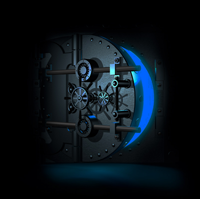 Once they are gone, the coins are gone, and only the book will be available. Many author’s give away a bookmark or signed bookplate for an extra charge, and like I have always been in many aspects of my life, I wanted to be different. There are varying stories about a “challenge coin” and their origin, but some historians believe the true concept of them date back to the Roman Empire. Soldiers within the Roman Empire were given special coins to recognize their achievements. In more modern times, “challenge coins” were given during World War I and beyond. Within modern American military service, just like in ancient Roman times, “challenge coins” are given to recognize certain achievements during military service. In addition to service commendations, some organizations will also give them as a symbol of a visit by a person to their headquarters etc. They hold many meanings, and they are often very special to the ones giving them, and to the ones receiving them. For The Black Vault? 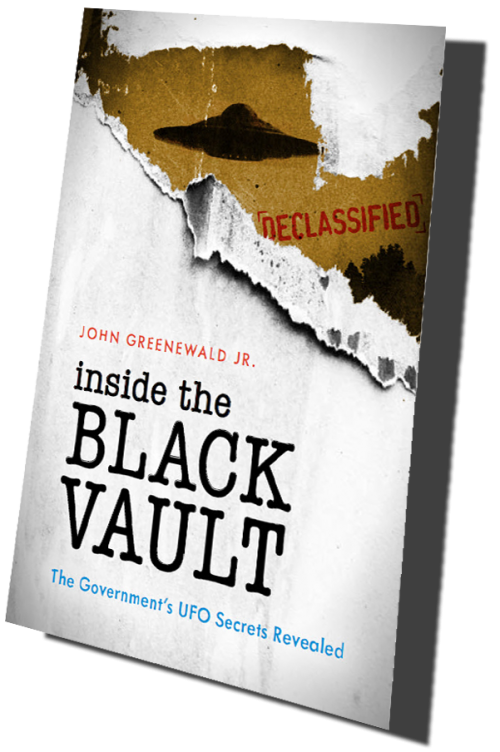 I am offering it to those first 500 initially taking the challenge to “Discover the Truth.” I feel my book challenges the normal, everyday thinking, about UFOs. Many want a “smoking gun” or a document that says, “aliens are real.” That makes it easy to accept but I am sorry to say it doesn’t exist. But do not let that deter you — the real “smoking gun” just involves a little bit of thinking — and trust me, that way is much more fun and educational. Research is sometimes difficult, and sometimes challenging. My aim with this book is to show you, with REAL evidence, that the cover-up is real and it is easily provable. 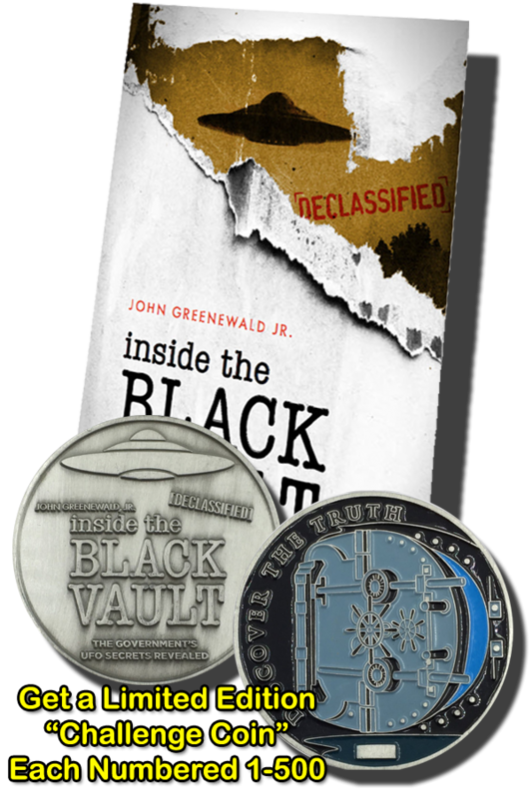 The “challenge coin” represents my challenge to you, to look at the real evidence, and with the use of only common sense, look logically at one of the most intriguing topics that pushes the boundary of the human realm of understanding. You may find your own “smoking gun” within the text of these pages, as I believe these pages, comprise the box of bullets for that gun. It comes down to what YOU need, on your journey, to accept this bizarre reality as something extraordinary. THAT is the “smoking gun” and it is different for each of us. “Discover the Truth” is emblazoned onto the coin as this has been a quiet catch-phrase and tagline for The Black Vault since DAY ONE. Some designs of my site have had it in the headline, while others have not. It’s a phrase that has a lot of meaning for me, and I hope, in time, for you too. Truth is hard to come by. It is hard to find. It is a CHALLENGE. I designed this coin for you to symbolize your journey in understanding this phenomenon, and a token of remembrance that sometimes all you have to do is look at the evidence in front of you to prove something big. It’s there, we just need to find it. Now — I CHALLENGE you to do just that — and DISCOVER THE TRUTH within this book. The inclusion of an exclusive, limited edition (of 500) “Challenge Coin” is something that means a lot to me personally. 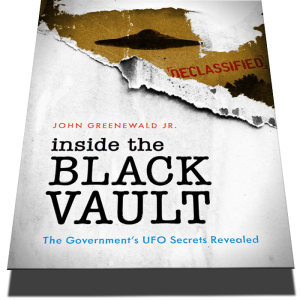 Not only because of the history behind them, but because of why I operate The Black Vault. There are varying stories about a “challenge coin” and their origin, but some historians believe the true concept of them date back to the Roman Empire. Soldiers within the Roman Empire were given special coins to recognize their achievements. In more modern times, “challenge coins” were given during World War I and beyond. Within modern American military service, just like in ancient Roman times, “challenge coins” are given to recognize certain achievements during military service. In addition to service commendations, some organizations will also give them as a symbol of a visit by a person to their headquarters etc. They hold many meanings, and they are often very special to the ones giving them, and to the ones receiving them.